The Ogun State Police Command has arrested Joshua Oyapidan, the man who allegedly stabbed his son, Favour, in the neck and stomach. He was paraded at the command headquarters, Eleweran, Abeokuta, yesterday. It had been reported on Monday that the suspect butchered his son, Favour, after he lured him into the bush near the President Muhammadu Buhari Estate, along Siun-Sagamu-Abeokuta Expressway. Favour, 11, was stabbed by the father in many parts of the body, including the neck and stomach, while the victim pretended to be dead. His father thereafter abandoned him in the bush. Before the incident, the victim was living with his father, stepmother and her two children at Abule Agbon, in the Obafemi-Owode Local Government Area of Ogun State. Favour, who later crawled out of the bush, was said to have been rescued by a Good Samaritan and was admitted to the Federal Medical Centre, Abeokuta. The suspect said he never knew what came over him on the day. Oyapidan, who claimed be an electrician and commercial motorcyclist (okada rider), said Favour had been a source of pain to him because he engaged in stealing and had run away from home many times. He explained that the baale of their community had threatened to banish him from the village because of his son’s behaviour. He said, “I had Favour while I was in secondary school, Adeoye Lambo Memorial High School, Obada Oko. I never got married to his mother because we were both young. “On that day, I returned from my okada work, and my neighbour told me that my son stole corn and bought some things in the name of my neighbour and I decided to deal with him. “I hid a kitchen knife in my pocket and I told him I was taking him to a new place. But on the way, I stabbed him in the neck and stomach, and we both fell into a ditch. “He was bleeding, and I used cloth to bind the wound in his stomach and I left him there and went home. 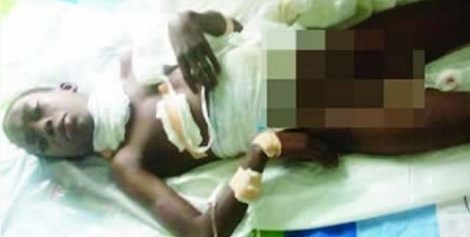 Thirty- year-old Oyapidan said his wife, Adeola, had deserted him because of his action. The state Police Public Relations Officer, Abimbola Oyeyemi, said the state Commissioner of Police, Ahmed Iliyasu, had directed that the suspect be charged to court after investigation. Oyeyemi added that the suspect would be charged with attempted murder.